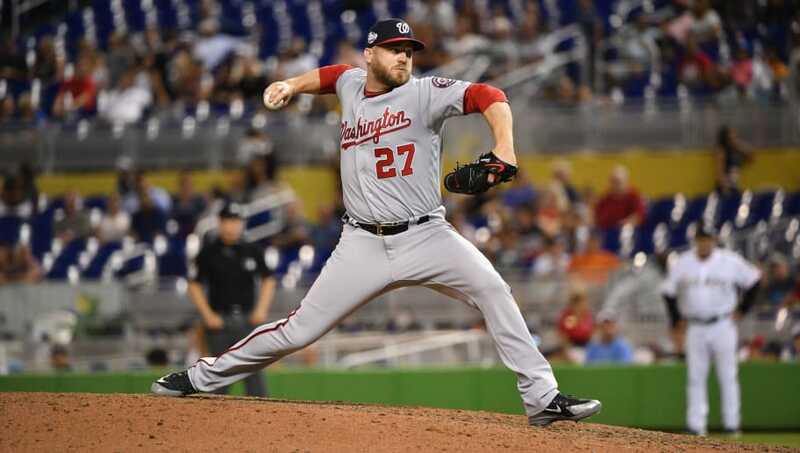 ​The Oakland Athletics have reportedly agreed on a deal with the ​Washington Nationals, which will send relief pitcher Shawn Kelly to Oakland. The details of the trade have yet to be announced. Shawn Kelley has been traded to the #Athletics from the #Nationals, source says. ​​Kelly has had a stellar season in the nation's capital after struggling to perform last year. He is currently posting a 3.34 ERA through 35 appearances. He was DFA'd by the team, though, after he tossed his glove during a blowout win over the Mets. We'll have to wait and see what Washington gets in return here. They have had a relatively disappointing season after winning the division crown last year, but they are still in the playoff race. Washington finds themselves six games behind the division leading Philadelphia Phillies and 4.5 games out of the Wild Card. The Athletics are enjoying a surprise year as they are currently sitting pretty in the second Wild Card spot in the AL. The A's trail the ​Houston Astros by five games for the division lead in the AL West. Oakland is hosting the Detroit Tigers tonight, while Washington defeated the Cincinnati Reds earlier today by a score of 2-1.